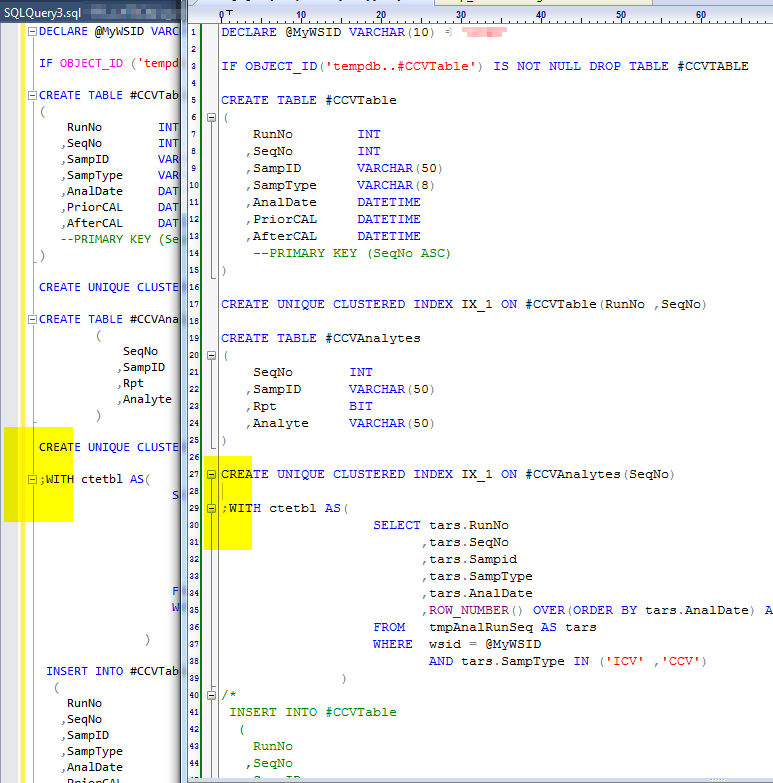 In the image above you can see that the code folding in SSMS 2016 (16.5) does not try and fold in the clustered index of the temp table above it into the CTE logic below it like it does in SQL Editor (64-bit). I tried adding whitespace but that didn't remedy it. The only thing that seems to break that up is ending the create unique clustered index line with a semicolon. It also seems INSERT INTO's aren't folded from the INSERT line (or the select) only areas where opening and closing parenthesis are wrapping columns and such. SSMS seems to be choosing where to fold a bit better. Per my update above, even if I remove the CTE anything following a CREATE UNIQUE statement seems to get folded into that statement. For instance, I have a "CREATE UNIQUE CLUSTERED INDEX" at line 52, at line 54 I have a few insert intos and some update statements. If I fold the "CREATE UNIQUE", the whole thing to line 232 folds with it. Also why does the code folding not fold at the start of the statement, all it wants to fold is my items wrapped in parens? *Edit: More specifically the LAST semi-colon in the begin/catch. You can see when I add that semicolon a new folding line appears next to it. That line goes all the way up to line 52. Any notes from dev on why semicolon seems to throw the folding logic off? And why folding doesn't apply to the top level of the statement? Only seems to care about parens and semicolons? Their response is that code folding is currently a generic implementation which isn't SQL dialect aware (database type). The way to improve it is to develop SQL dialect specific versions. Something they are planning to do.